The contact person responsible for data processing is Mag. Daniela Luschin-Wangail, Managing Director of Gesar Travel & more KG, reachable at daniela@gesar-travel.com, Tel. 0043 650 41 68 339. By using our services and consenting to this statement, you confirm that you are at least 14 years of age and are able to legally consent, or that your guardian or administrator has already given effective consent. The following points provide a simple overview of what happens to your personal data when you book a trip with us. will be required for our services. This, in particular, includes bookings for trips, tour guides, hotels/camps/lodges,restaurants, wellness treatments, rental vehicles, transfers, flights, registrations, insurance, events, tours and excursions, accreditations, vouchers including customer deposit, billing and verification (B2B, B2C, FIT). For these purposes we store, process and, as far as necessary, transmit data to third parties, including service providers in third countries as processors for travel bookings, software, and agency services. We do not utilise profiling and automated decisions. our legitimate interests (e.g. the improvement of our customer service, including the direct advertising or the exercise of our own legal interests). The storage duration depends on the duration of our business relationship, the consent given by you, and the statutory retention and legal obligations applicable to us. We emphasize, that, in the case of regular cooperation, we intend to know the customer wishes that have already been conveyed to us well enough to achieve the best possible customer service and aim to satisfy you constantly. Data processing on this website is carried out by the website operator, Mag. Daniela Luschin-Wangail, Managing Director at Gesar Travel & more KG, reachable at daniela@gesar-travel.com, Tel. 0043 650 41 68 339. By visiting our website, your access data will be automatically collected and stored. This may include the page accessed, the files viewed, the date and time of access, the IP address of the user, data of the accessing computer, the browser and the operating system, as well as the data volume and a notification of the successful access. This data is used for internal statistical purposes, to ensure the security of our offers, and to optimize them. If an unlawful act is suspected, the access data will be examined to secure evidence. Your data is primarily collected by you giving it to us. This may be, for example, data that you enter into the contact form. By entering your personal data in one of our contact forms, you consent to the transmission, storage, and processing by us for the duration of this specific request. This is especially the case for any requests you send us via contact form, chat, Whatsapp, and email. We require this data to process your request, and in these cases also store your IP address for purposes of preserving evidence. The data storage takes place as long as it is necessary for you or us to take care of any supplementary or subsequently asked questions. Other data is automatically saved by our IT-system following a visit to our website. This includes technical data (e.g. internet browser, operating system, and time of access). This data is recorded automatically when you access our website. If you create a web account with us, we will provide you with contract data online. You carefully store your access data and ensure that no unauthorized persons access the account. We assume no liability for any unauthorized access that can be traced back to an even partial misconduct on your part. Your account data will only be transferred via an encrypted internet connection (https). We assume no liability for the loss of data or third party access to your data if we have followed the security measures required by the state of the art. The legal basis for data processing is your consent, our pre-contractual and contractual obligations to you, our legitimate interests and legal obligations of all kinds, and § 96 TKG. You have the right to obtain free information about the origin, recipient and purpose of your stored personal data at any time. You also have a right to request the correction, blocking or deletion of this data. For further questions on this or data protection, you can contact us at any time at the address listed in the Impressum . Furthermore, you have a right to appeal to the competent supervisory authority. to third parties involved in the provision of the services you request (e.g. overseas booking transactions). Should compliance with European data protection standards not be possible – if, for example, standard contractual clauses, adequacy decisions, or certifications are not guaranteed in the specific case – we will inform you in good time and obtain the necessary consent from you. For more information, please contact us at daniela@gesar-travel.com. Please note that data transmission over the Internet (e.g. communication via email) may have security flaws. A complete protection of the data from access by third parties is not possible. For more information about your rights as an affected party, please contact us at daniela@gesar-travel.com (Daniela Luschin-Wangail, Manager). We are happy to help. You can request information about your personal data stored by us free of charge at any time. As an affected party, you also have the right to revocation, information, deletion, rectification, limitation and transfer of your personal data, given that there is no legal duty of retention on our part. A message by email to us is sufficient. The legality of the data processing carried out before the time of revocation remains. In the case of violations of the data protection law, the person concerned has the right of appeal to the responsible supervisory authority. The responsible supervisory authority for data protection issues is the state’s Data Protection Officer for the state in which our company is based. For complaints, the responsible supervisory authority is the Austrian Data Protection Authority (DSB), Wickenburggasse 8-10, 1080 Vienna. This website uses an SSL or TLS encryption for security reasons and to protect the transmission of confidential content, such as orders or requests that you send to us as site operator. You can recognize an encrypted connection by the change in the address line of the browser from “http: //” to “https: //” and the lock symbol in your browser line. If the SSL or TLS encryption is enabled, the data you have submitted cannot be read by third parties. You have the right to free information on your stored personal data, their origin and recipient and the purpose of the data processing and, if necessary, a right to rectification, blocking or deletion of this data. For further information on personal data, please contact us at daniela@gesar-travel.com. We prohibit the use of the contact data, published as part of our duty to publish an imprint, to send unsolicited advertising and information materials. The operators of this website expressly reserve the right to take legal action in the event of the unsolicited sending of advertising information, for example through spam emails. Cookies do not harm your computer and do not contain viruses. Cookies serve to make our offer more user-friendly, effective and secure. Most of the cookies we use are so-called “session cookies”. They are deleted automatically after your visit to the website. Other cookies remain stored on your device until you delete them. These cookies allow us to recognize your browser the next time you visit. After you have visited our website, cookies remain stored on your device, unless you refuse them from the outset or you do not actively delete cookies. The disabling of cookies may affect the functionality of our websites. You can prevent the storage of cookies in the appropriate setting of your browser software. In this case, however, we would like to point out that you may not be able to use all the features of our website. You may also prevent the forwarding of the data (including IP-address), created through the Cookie and your visit to our website, by downloading and installing the browser-plugin available on the website google.com. However, the plugin is only available for certain browser programs. You can set your browser so that you are informed about the setting of cookies and allow cookies only in individual cases, which exclude the acceptance of cookies for certain cases or in general, and enable the automatic deletion of cookies when closing the browser. Deactivating Cookies may lead to an inhibited functionality of this website. We also use third-party content on our website to make our website as informative and convenient for you as possible. This includes, for example, Google-Maps, RSS-Feeds or Youtube. For technical reasons, these third parties receive your IP-address. We do not have any influence on the usage of the data by third parties. In this case, we refer to the privacy statements of the respective provider. If you send us inquiries via the contact form, your details from the form, including the contact details you provided there, will be stored in order to process the request and in case of follow-up questions. We will not share this information without your consent. The processing of the data entered into the contact form is therefore exclusively based on your consent (Art. 6 (1) lit. DSGVO). You can revoke this consent at any time. 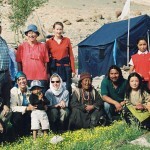 For this, send a message by email to daniela@gesar-travel.com. The legality of the data processing carried out before the time of revocation remains. The information you provide in the contact form will remain with us until you ask us to delete it, revoke your consent to storage or the purpose for data storage becomes void (for example, after your request has been processed). Mandatory statutory provisions – especially retention periods – remain unaffected. You can register on our website to use additional features. We only use the data entered for the purpose of using the respective offer or service for which you have registered. The mandatory information requested during registration must be fully given, otherwise, we will reject the registration. For important changes, such as the scope of the offer or for technical changes, we use the email address specified during registration to inform you. The processing of the data entered during registration takes place on the basis of your consent (Art. 6 (1) lit. DSGVO). You can revoke your consent at any time. An email to us is sufficient. The legality of the data processing carried out before the time of revocation remains. In addition to your comment, the comment function on this page will also contain information about when the comment was created, your email address and, if you do not post anonymously, the username you selected. Our comment function stores the IP addresses of the users who write comments. Since we do not check comments on our site before publication, we need this information in order to be able to act against the author in case of infringements such as insults or propaganda. The comments are stored on the basis of your consent (Art. 6 (1) a DSGVO). You can revoke your consent at any time. An email to us is sufficient. The legality of the data processing carried out before the time of revocation remains. When you visit our pages, the plugin establishes a direct connection between your browser and the Facebook server. Facebook then receives the information that you have visited our site with your IP address. If you click on the Facebook “Like-Button” while you are logged into your Facebook account, you can link the contents of our pages to your Facebook profile. As a result, Facebook can assign the visit to our pages to your user account. We point out that we as the provider of the pages are not aware of the content of the data transmitted and its use by Facebook. For technical reasons, Facebook receives your IP address. We have no influence on the use of this data by Facebook. We refer to the privacy statements of Facebook, in particular the information available at the following link: https://www.facebook.com/help/568137493302217. This also gives you information on how to use your browser to block Facebook social plugins. If you oppose Facebook linking your visit to our website with your Facebook user account, please log out of your Facebook user account. Your privacy settings on Twitter can be found and changed in the account settings at https://twitter.com/account/settings. Our website uses functions from Google+. The provider is Google Inc., 1600 Amphitheatre Parkway, Mountain View, CA 94043, USA. Collection and dissemination of information: With the help of the Google+-button, you can publish information worldwide. The Google + button will provide you and other users with personalized content from Google and our partners. Google stores both the information that you gave a +1 for, as well as information about the page you viewed when you clicked +1. Your + 1’s may appear alongside your profile name and photo in Google services, such as in search results or your Google profile, or elsewhere on websites and ads on the web. Google records information about your +1 activities to improve Google’s services to you and others. To use the Google + button, you need a globally visible, public Google profile that must at least contain the name chosen for the profile. This name is used in all Google-services. In some cases, this name may also replace a different name, which you have used when sharing content on your Google-account. The identity of your Google-profile can be seen by users, who know your email address or have other identifying information about you. Our website uses functions from Instagram. The provider is Instagram Inc., 1601 Willow Road, Menlo Park, CA 94025, USA. If you are logged into your Instagram account, you can link the contents of our pages to your Instagram profile by clicking on the Instagram button. This allows Instagram to link the visit to our website with your user account. We point out that we as the provider of the pages do not receive knowledge of the content of the transmitted data and its use by Instagram. We have enabled the IP-anonymization function on this website. As a result, your IP address will be shortened by Google within the member states of the European Union or other countries within the European Economic Area prior to transmission to the United States. Only in exceptional cases will the full IP address be sent to a Google server in the US and shortened there. On behalf of the operator of this website, Google will use this information to evaluate your use of the website, to compile reports on website activity and to provide other services related to website and internet usage to the website operator. The IP address provided by your browser as part of Google Analytics Google Analytics will not be merged with other Google data. You can prevent the collection of your data by Google Analytics by clicking on the following link. An opt-out cookie will be set to prevent your data from being collected on future visits to this site:. We have entered into a data processing agreement with Google and are fully implementing the data protection authorities’ requirements when using Google Analytics. The IP address provided by your browser as part of Google Analytics Google Analytics will not be merged with other Google data. This feature allows the Google Analytics remarketing ad groups to be linked to the cross-device features of Google AdWords and Google DoubleClick. Through this, interest-based, personalized advertising messages, that have been customized based on your previous usage and browsing behavior on one end device (e.g. cell phone), may also be displayed on another end device (e.g. tablet or PC). Once you have given your consent, Google will associate your web and app browsing history with your Google Account. That way, the same personalized advertising messages can appear on any device you sign in to with your Google Account. You can permanently opt out of cross-device remarketing/targeting by turning off personalized advertising in your Google Account. Follow this link: https://www.google.com/settings/ads/onweb/. The aggregation of the collected data in your Google Account is based solely on your consent, which you can submit or revoke on Google (Art. 6 Abs. 1 lit. a DSGVO). Data collection operations that are not merged with your Google Account (for example, because you do not have a Google Account or have opposed the merge) are based on Art. 6 Abs. 1 lit. f DSGVO. The legitimate interest arises from the fact that the website operator has an interest in the anonymous analysis of the website visitors for advertising purposes. As part of Google AdWords, we use so-called conversion tracking. When you click on an ad served by Google, a conversion tracking cookie is set. Cookies are small text files that the Internet browser stores on the user’s computer. These cookies lose their validity after 30 days and are not used for the personal identification of the users. If the user visits certain pages of this website and the cookie has not expired yet, Google and we can recognize that the user clicked on the ad and was redirected to this page. Each Google AdWords customer receives a different cookie. The cookies can not be tracked through the websites of advertisers. The information gathered using the conversion cookie is used to generate conversion statistics for AdWords advertisers who have opted for conversion tracking. The customers can see the total number of users who clicked on their ad and were redirected to a conversion tracking tag page. However, they do not receive information that personally identifies users. If you do not want to participate in tracking, you can opt-out of this by easily disabling the Google Conversion Tracking cookie through your Internet browser under User Preferences. You will not be included in the conversion tracking statistics. The storage of “conversion cookies” is based on Art. 6 Abs. 1 lit. f DSGVO. The website operator has a legitimate interest in analyzing user behavior in order to optimize both the website and its advertising. You can set your browser so that you are informed about the setting of cookies and only allow cookies in specific cases, exclude the acceptance of cookies for certain cases or in general, and enable the automatic deletion of cookies when closing the browser. Disabling cookies may limit the functionality of this website. Our website uses Facebook’s Tracking Pixel as a conversion measure, provided by Facebook Inc., 1601 S. California Ave, Palo Alto, CA 94304, USA (“Facebook”). This way, the behavior of the website visitors can be tracked after they have been redirected to the provider’s website by clicking on a Facebook ad. As a result, the effectiveness of Facebook advertisements can be evaluated for statistical and market research purposes and future advertising measures can be optimized. The collected data is anonymous to us as the operator of this website, we cannot draw conclusions about the identity of the users. However, the data is stored and processed by Facebook so that a connection to the respective user profile is possible. Facebook can use the data for its own advertising purposes, in accordance with the Facebook data usage directive. As a result, Facebook can enable ads to be displayed on and outside of Facebook. This use of data cannot be influenced by us as the site operator. You can find more information on Facebook and your privacy security here: https://www.facebook.com/about/privacy/. You can also activate the remarketing feature “Custom Audiences” in the Ads Settings section at: https://www.facebook.com/ads/preferences/?entry_product=ad_settings_screen . You must be logged onto Facebook to do this. If you do not have a Facebook account, you can opt out of usage-based advertising from Facebook on the European Interactive Digital Advertising Alliance website: http://www.youronlinechoices.com/de/praferenzmanagement/. You are free to subscribe to our newsletter. The registration for the newsletter, for which you have to provide your email address and give your consent, cannot take effect until you confirm a link to the registration you receive by email. Further data is collected only on a voluntary basis. We use this data exclusively for the delivery of the requested information and do not pass it on to third parties. In every newsletter you receive, you will find all the information you need to unsubscribe from the newsletter. For more information about our newsletters, please contact us at daniela@gesar-travel.com. We will be glad to help. The content of our website has been carefully prepared and checked several times, but we assume no liability for the topicality, correctness and completeness of the information provided. Claims for damages for the use or non-use of the information or for the use of incorrect or incomplete information are void. All offers are non-binding. We reserve the right to change, supplement or delete the offer or parts thereof without prior notice, as well as to temporarily or permanently cease publication of the website. The content and programming of our website is protected by ancillary copyright. Any duplication – including in extracts – and public reproduction, especially the copying of texts, graphics and photos, is prohibited without our prior written consent. The processing of the data entered in the newsletter registration form is based solely on your consent (Art. 6 Abs. 1 lit. a DSGVO). The granted consent to the storage of the data, the email address and its receival of the newsletter can be revoked at any time, for example via the “unsubscribe” link in the newsletter. The legality of the data processing carried out before the time of revocation remains.. The data given to us for the purpose of obtaining the newsletter will be saved by us and will be deleted after cancellation of the newsletter. Data that has been stored for other purposes with us (such as email addresses for the members area) remain unaffected. To do this, the browser you use must connect to Google’s servers. As a result, Google learns that our website has been accessed via your IP address. The use of Google Web Fonts is in the interest of a consistent and attractive presentation of our online services. This constitutes a legitimate interest within the Art. 6 Abs. 1 lit. f DSGVO. his site uses the mapping service Google Maps via an API. The provider is Google Inc., 1600 Amphitheatre Parkway, Mountain View, CA 94043, USA. To use the features of Google Maps, it is necessary to save your IP address. This information is usually transmitted to and stored on a Google server in the United States. The provider of this website has no influence on the data transmission. The use of Google Maps is in the interest of an attractive presentation of our online offers and a simple traceability of the places indicated on the website. This constitutes a legitimate interest within the Art. 6 Abs. 1 lit. f DSGVO. We have implemented organizational and technical safeguards that we continually evaluate and adapt to protect your personal information, which we store and process.